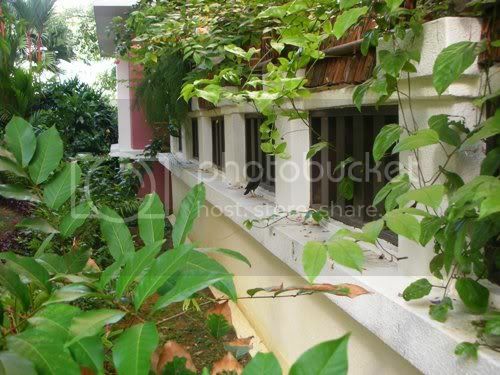 The garden in our condo is rich in greeneries with flowers sprouting everywhere too. Every Sunday morning, we will take a stroll in the garden and see what birds that we can spot amongst the various trees. It’s indeed a thrill to Little Edison as he loves to shoo them away too. There is also a delightful fish pond with lots of Koi fish and a turtle. 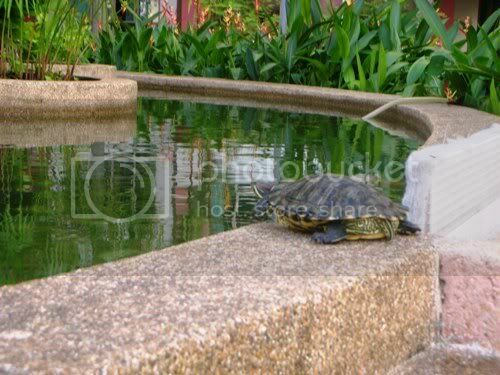 At times, I really wonder how this turtle can live with so many Koi fishes in this pond. Today is our lucky day as we spotted this turtle climbing out of the pond to do his sun-bathing! Little Edison is jumping with joy as he watches the turtle in close-up. Within minutes, the turtle dives into the pond with a big splash! There are also two playgrounds here. The main playground is located near the side entrance, next to the basketball and tennis court. There is another mini playground at the garden that is often ‘undiscovered’ by the residents. This mini playground is my favorite, it is quiet and under the shade most of the times.